Seniors, congratulations! I remember fifty years ago we sat through this banquet with one eye on the clock—when would we liberated from all those old people? And here we are, the “old people.” The class of 1968. We were the class that switched from rectangular class rings to round rings. We were the class that created a cover to our yearbook that saluted the design themes of the 1960s. Mod-royalty, I believe it was called. For points on “dress up day,” some of the guys in our class brought dark colored socks and wrestled a young man who was a farmer to the ground to remove his white socks (for which we got demerits but which he always wore) and put on those dark socks. But because, underneath his sweater, he wore a fake tie, one that attached in the front, rather than a “true tie”—we never did win “dress up day.” Imagine that being the most important thing on certain Fridays in high school. Yes I was a cheerleader. 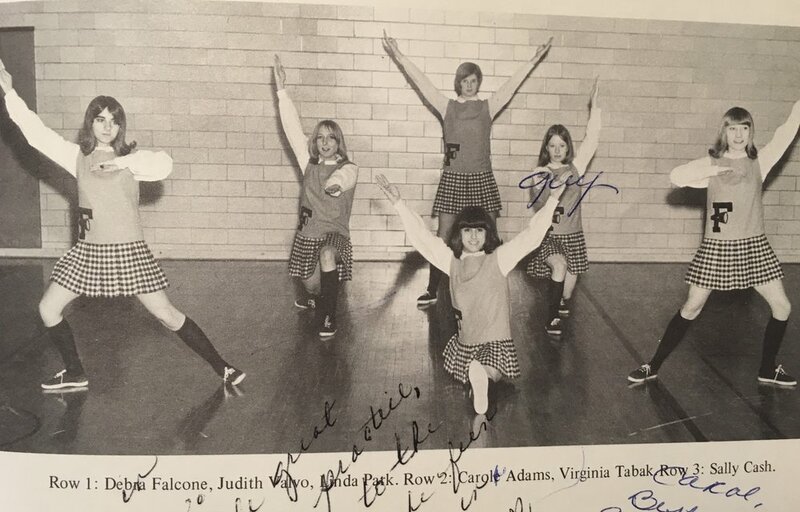 Cheerleading was one of the few athletic options for girls before Title IX. This was the longest our hair could be, truly! The cheerleaders were ordered to cut our hair to chin length, because long hair was unruly and did not represent the school well. It was as though the administration didn’t know about rubber bands and pony tails. Yes, a gulf of fifty years separates us as well as seismic cultural changes, but I’m interested in what unites us. This year teenagers across the country—high school seniors, especially, showed us what is possible in terms of activism. Around many issues, they organized in their schools, their communities, in their states, and in Washington. They used social media in sophisticated ways. They learned that their voices could be heard. And guess what? The last time this really happened was in 1968, when youth around the Western world protested. In the streets of Paris, in the halls of Columbia University, claiming the right to free speech in Berkeley, California, and in between the east and west coast, throughout the country. High school students walked out in solidarity with the Columbia students. The great writer Hannah Arendt—known for coining the term “banality of evil” in response to Adolf Eichmann, a Nazi on trial in Israel in the early 1960s— predicted back in 1968, “The children of the next century will once learn about 1968 the way we learned about 1848.” 1848 was known as the “Year of Revolution,” and the “People’s Spring.” Sadly, I don’t think 1968 has been taught in this way..
It’s said “if you remember the 60s you weren’t there.” It’s a joke about all the drugs that were used during that decade. But consider our high school years. While my classmates were in eighth grade, we learned of the assassination of President John F. Kennedy over the loud speaker into each class room in the high school. Just before tenth grade, the first school shooting occurred when Charles Wittman killed 16 people from the observation deck at the tower at the University of Texas at Austin. He had already killed his wife and mother. Then on April 4 1968, just before we were to take our Senior Class trip to Washington, Martin Luther King, Jr. was assassinated in Memphis. Today through social media—I use twitter, myself—the information on the death of someone important is communicated immediately around the world. But, when we arrived in school the next day, and began talking with one of our teachers, we had to tell him of this devastating death. He had not yet heard. King died at 8:05 p.m. our time the night before. But if you hadn’t watched television, with the “we interrupt this program with this news” you would have no idea that King had died. Imagine 12 hours going by without information like this getting around. Of all the classes of that decade and the next, we are probably the only one without a photo in front of the capital. Our class did not go to Washington, It could not go to Washington. What was called the “Holy Week Uprising” in response to King’d death took place and the greatest wave of social unrest the United States had experienced since the Civil War occurred in large urban cities like Baltimore, Chicago and yes Washington. So our class went to Montreal and Quebec. Did we understand the social schism of racism, urban segregation, and ongoing discrimination that contributed to these riots and the upsetment of our plans? We felt so removed from that crisis of the time here in Forestville. Friends, when you take a senior trip, usually all the students are concentrated on just a few floors in the hotel to allow the chaperones easy ways to keep their eyes on everybody. But the hotel bookings were made so late, we were scattered over 20 floors in the hotel and this defeated the chaperones ability to chaperone the students or, frankly, each other. Let’s just say, the issue of boundary violations has a long history. And, as we gathered last night, we all remembered how it took several of us, at the very last minute, just as the bus was about to leave, to talk one of our classmates onto the bus. She had fallen in love and she wanted to stay in Canada! As she boarded the bus, she gave her new love—Taso— her class ring—that new round design—and he ran after our bus calling to her as it pulled down the street. Then, on June 6, 1968, New York Senator Robert Kennedy was shot after winning the California primary. He died the next day. I remember calling the teacher who had not known about King’s death at about 7 a.m. the next morning before school, so that he wouldn’t be shocked about this news about Kennedy when he got to school. He was the government teacher--that is why it was so important for him to know. And so we graduated having lived through some of the most heart wrenching public deaths of our time. Some of us entered the military, some served in Vietnam and one of our former classmates was killed during the "Tet Offensive"—one of the words that the year 1968 gave us. And some of us protested the Vietnam War. Some of us went to college and some of us applied for jobs. Fifty years ago, one of my classmates who applied to work at the telephone company was asked, wasn’t she needed at home to help take care of her widowed father and her younger brother instead of taking a job? It was in those years that job ads were listed under “help wanted: men” and “help wanted: women.” It is women from the class of 1968 all over the country (but not only they), who helped to change that. In the 1960s women earned 59 cents to a man’s earning a dollar, in 2010, it was 77 cents to a man’s dollar. Hey, by the time your granddaughters are graduating from high school the gender pay gap may have been closed. So, it’s no surprise that 1968 is also the year that the women’s liberation movement received alot of attention when it protested the Miss America convention in Atlantic City, protesting that women weren’t pieces of meat. I guess I should mention I am the author of a book called The Sexual Politics of Meat. Note: exactly fifty years later, the swimsuit contest has been eliminated. Here’s another term that 1968 gave our cultuer: “bra burner.” It’s from that Miss America protest. So, from 1968 and "bra burner" to 2018 and #MeToo, the world has been forced to listen to women’s voices. But change is sadly so slow in coming. In talking about that year, 1968, it’s been said that the protests associated with the class of 1968 are the last to have occurred without the awareness of the gaping hole in the ozone layer. and the fact that the earth has finite resources. The first Earth Day was still two years away. In 1968 we were part of a generation trying to change the world Challenging Racism. Sexism. Homophobia. Your generation has an even harder task. Your generation faces the challenge of repairing the world. Seniors…You hold our future in your hands. Being involved in the world is the tax we pay as citizens. Know this, you can change the world. You can use your education to help others. You can hold onto a vision for a just world and help to bring it about. Your peers around the country are doing that now. Seniors, again our congratulations. And, gulp, see you in fifty years?